supporting communities and water systems in replacing lead service lines and taking other steps to get lead out of contact with drinking water. Lead has been used for thousands of years, and has historically had many uses due to its ease of extraction and malleability. Lead was commonly used to make water pipes and for many other uses in the Roman Empire. In the Industrial Revolution, new uses for lead emerged; including lead based paints, and leaded gasoline. As the scale of lead use increased, so did the understanding of health risks, eventually leading to a decrease in lead use for many common uses . Lead exposure can occur through inhalation, ingestion and to a lesser extent, dermal contact. The most common way people are exposed is from ingestion of old lead paint. As the paint ages, it peels and breaks down into dust, then enters the body through hand to mouth contact or contamination of food or water. There are also risks of workplace exposure in fields that may come into contact with lead, including, but not limited to the construction, manufacturing and solid waste/recycling sectors. Children under six are most at risk from lead poisoning. Exposure to high levels of lead can cause severe damage to the brain, blood and kidneys. Even low levels of lead exposure have been found to permanently reduce cognitive ability and cause hyperactivity in children. Long term exposure can cause reproductive harm and infertility. Pregnant women are susceptible to lead, as exposure can harm the fetus, reducing growth rates and causing premature birth and/or miscarriage. 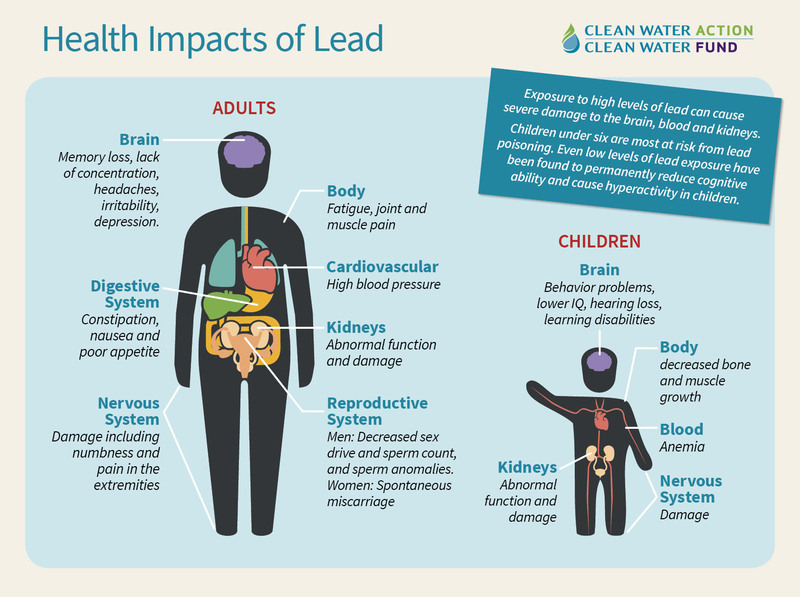 Why is lead in drinking water? Exposure to lead from drinking water is less common than other pathways yet, as demonstrated in Flint, MI, can have serious consequences. 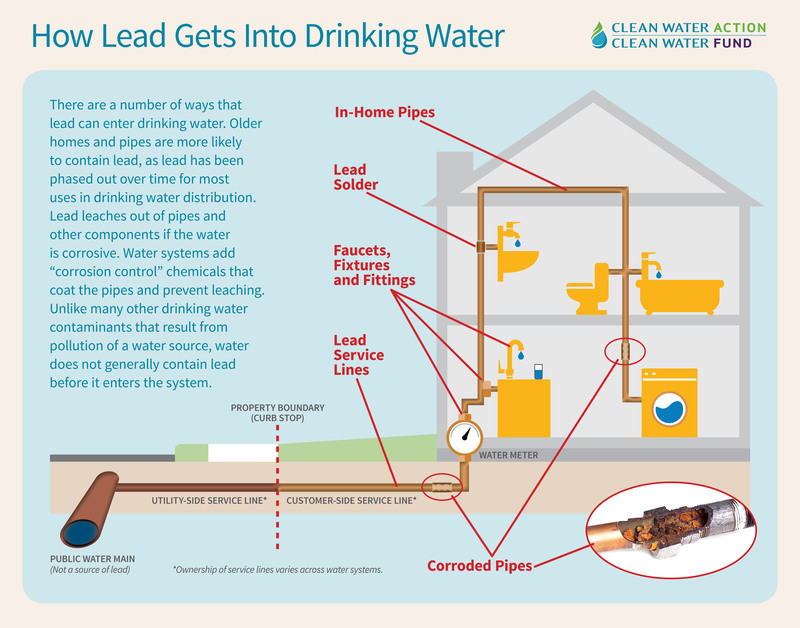 Lead can enter drinking water when service lines, pipes in the home and other plumbing fixtures, or solder that contain lead corrode. Older homes, especially those built before 1986, are more likely to have lead service lines, fixtures and solder. However, even newer “lead-free” fixtures could contain up to eight percent lead until 2013. Lead, unlike many other drinking water contaminants, is usually not present in the drinking water source, but rather results from the distribution system or on site plumbing itself. Lead gets into water at the tap when water with “corrosive” chemistry comes into contact with lead in pipes, fixtures, and solder. Stop using lead pipes, fixtures and solder: Current regulation requires that all new pipes and fixtures be “lead-free” - containing less than 0.25% lead (weighted average). Replace lead service lines: There are roughly 6 million lead service lines (LSL’s) in the US. Roughly 30% of the country’s water systems contain LSL’s, serving an estimated 15 to 22 million people. Many water systems have taken steps to remove LSL’s and since the Lead and Copper Rule was adopted in 1991. The number of LSL’s has been reduced by roughly 40%. Reduce corrosion and check water chemistry: A critical part of modern drinking water treatment is minimizing corrosion to keep lead out of drinking water and to address other issues. Corrosion Control Treatment (CCT) is especially important where there are LSL’s. CCT varies from water system to water system based on the age of pipes and service lines, where the drinking water comes from and its chemistry, and the size of the system. You can reduce risk of lead exposure from drinking water in your home too. First, understand whether you may be at risk of lead exposure in your home. Learn about lead levels in your community: Every year, public water systems prepare a Consumer Confidence Report (CCR), which includes information on lead monitoring results. For more information and help finding your CCR: https://www.epa.gov/ccr/. Water systems also post lead monitoring results online. Have your water tested: If you are concerned about lead in your tap water you can test your water for lead and other contaminants. Some water systems will provide lead testing for their customers. Others will provide information on local laboratories and other resources. There are low cost tests available. EPA fact sheet on testing. Call your water system to see if testing is available. Flush your pipes before drinking: The longer water sits in pipes, the more lead it may contain. Running the water until becomes as cold as possible can help ensure that you are drinking water that has not been sitting still in your pipes. This can take 5-30 seconds if there has been recent water use from that faucet, up to two minutes if not. Use cold water for drinking and eating: Cold water is less likely to contain lead. Never add warm water to baby formula. Note: Boiling water will not get rid of lead contamination. Use water filters or treatment devices: Only specific products are designed to reduce lead contamination. Learn more about products certified to reduce lead. The Safe Drinking Water Act (SDWA), first passed in 1974, sets standards for contaminants in drinking water in order to protect public. The Lead and Copper Rule (LCR), first adopted in 1991, is meant to reduce exposure to lead and copper in tap water. Learn more about the Lead and Copper Rule here. Since 2006, EPA has been engaged in “Long Term” Revisions to the Lead and Copper Rule. A proposed Rule is expected in 2017 and a Revised Rule finalized in 2018. Learn more about the Revision process here. Coming soon.